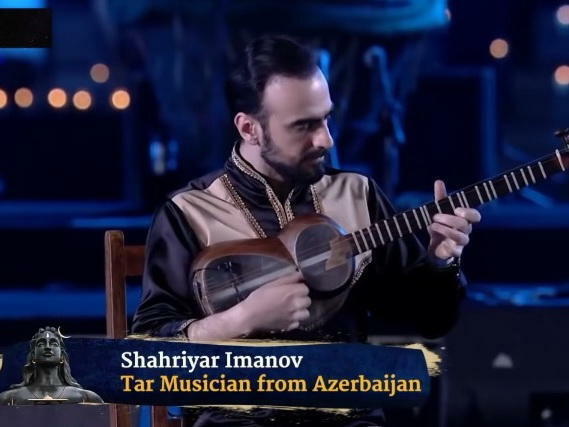 Azerbaijani tar musician Shahriyar Imanov performed in India. The musician took part in the festival in honor of one of the gods of Hinduism, Shiva, held in the city of Coimbatore on March 4-5. Shahriyar Imanov shared the same stage with Babir Bagirov and Shukur Aliyev, Day.Az reported. The audience was mesmerized by the captivating performance showcased by the Azerbaijani musicians. It caused a lot of positive emotions and got a round of applause. It is worth noting that Sadhguru, a recognized Indian yogi and mystic was among the spectators, who also stood applauding to the musicians. Shahriyar Imanov had his first competitive entry in 1999 in memory of Haji Mammadov and won the 1st place. His first solo concert took place in 2001. The musician was accompanied by the Azerbaijan State Orchestra. In 2007, he won the Republican contest in memory of Akhsan Dadashov. Noteworthy, tar is one of the most beautiful instruments in Azerbaijani culture and is played with a mediator. It is made from mulberry, walnut and pear trees, and the face of the instrument is made from cattle heart membrane. Its strings differ by thickness and composition.